Within Blackboard Learn, some external tools (such as SafeAssign) require your internet browser to allow third-party cookies. To unblock or allow third-party cookies for your browser, follow the steps below for the browser you are using. Click the Chrome Settings button ( ) in the upper-right corner of the browser, and then click Settings. The Settings page will open in a new tab. Scroll to the bottom of the Settings page, and click Show advanced settings. Under the Privacy section, click Content settings. 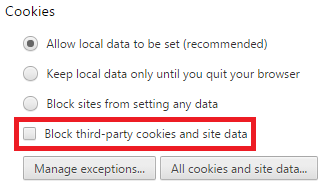 Deselect the check box Block third-party cookies and site data. When finished, you can close the tab. Click the menu button and then click Options. The Options page will open in a new tab. Click Privacy in the left panel. 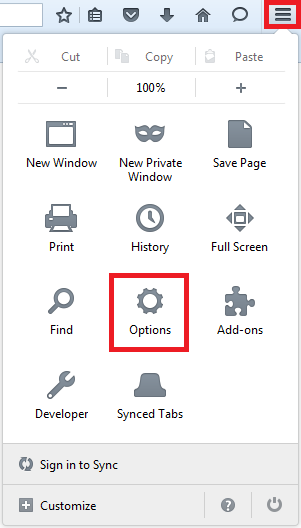 In the drop-down menu for Firefox will, choose Use custom settings for history. Select the check box for Accept cookies from sites. 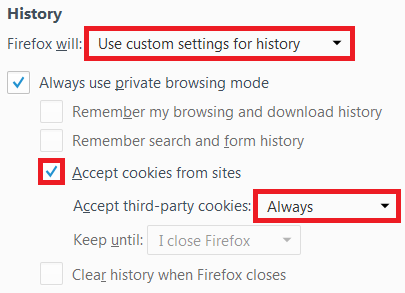 In the drop-down menu for Accept third-party cookies, choose Always. 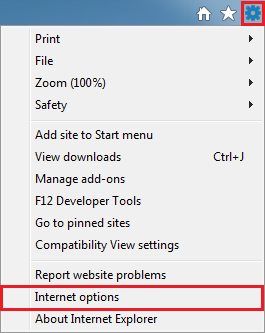 Click the gear icon in the upper-right corner of the browser, and then click Internet options. 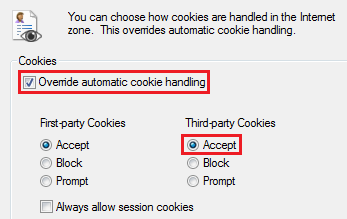 Select the check box for Override automatic cookie handling. Go to Safari Preferences (⌘ ,). In Block cookies, select the option Never.